In Hospital One Month Korfmann photographed over the span of one month the OLVG Hospital in Amsterdam from the window of her studio which was situated across the street. Every evening she photographed the same three windows. The image behind the windows changes each time, sometimes the light is on, sometimes it is dark, and in some pictures there are people executing some tasks, while in others the space is empty. In this way the work registers the events which occur within this period at this specific location. The photos are finally compressed and put into a sequence to form a dense matrix. 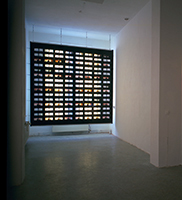 The work is presented as a large hanging slide, lit from behind, so that the installation itself takes the form of the facade of a building with lit windows through which we can peek inside.